Okay, so we have a basic skeleton for an application and we can add new issues into the database, then fetch them from a Flask API. So far, though, we don't have any domain logic at all. All we have is a whole bunch of complicated crap where we could just have a tiny Django app. Let's work through some more use-cases and start to flesh things out. So when we've added a reported issue to the issue log, what happens next? Well we need to triage the problem and decide how urgent it is. Then we might assign it to a particular engineer, or we might leave it on the queue to be picked up by anyone. Wait, the queue? I thought you had an issue log, are they the same thing, or is there a difference? Oh, yes. The issue log is just a record of all the issues we have received, but we work from the queue. I see, and how do things get into the queue? We triage the new items in the issue log to decide how urgent they are, and what categories they should be in. When we know how to categorise them, and how urgent they are, we treat the issues as a queue, and work through them in priority order. This is because users always set things to "Extremely urgent"? Yeah, it's just easier for us to triage the issues ourselves. And what does that actually mean, like, do you just read the ticket and say "oh, this is 5 important, and it's in the broken mouse category"? Mmmm... more or less, sometimes we need to ask more questions from the user so we'll email them, or call them. Most things are first-come, first-served, but occasionally someone needs a fix before they can go to a meeting or something. So you email the user to get more information, or you call them up, and then you use that information to assess the priority of the issue - sorry triage the issue, and work what category it should go in... what do the categories achieve? Why categorise? Partly for reporting, so we can see what stuff is taking up the most time, or if there are clusters of similar problems on a particular batch of laptops for example. Mostly because different engineers have different skills, like if you have a problem with the Active Directory domain, then you should send that to Barry, or if it's an Exchange problem, then George can sort it out, and Mike has the equipment log so he can give you a temporary laptop and so on, and so on. Okay, and where do I find this "queue"? Your customer grins and gestures at the wall where a large whiteboard is covered in post-its and stickers of different colours. How can we map these requirements back to our system? Looking back over our notes with the domain expert, there's a few obvious verbs that we should use to model our use cases. We can triage an issue, which means we prioritise and categorise it; we can assign a triaged issue to an engineer, or an engineer can pick up an unassigned issue. There's also a whole piece about asking questions, which we might do synchronously by making a phone call and filling out some more details, or asynchronously by sending an email. The Queue, with all of its stickers and sigils and swimlanes looks too complicated to handle today, so we'll dig deeper into that separately. We're introducing a new concept - Issues now have a state, and a newly reported issue begins in the AwaitingTriage state. We can quickly add a command and handler that allows us to triage an issue. Triaging an issue, for now, is a matter of selecting a category and priority. We'll use a free string for category, and an enumeration for Priority. Once an issue is triaged, it enters the AwaitingAssignment state. At some point we'll need to add some view builders to list issues that are waiting for triage or assignment, but for now let's quickly add a handler so that an engineer can Pick an issue from the queue. Mutate the state by calling a method on our domain model. Notify other parts of the system that our state has changed. So far, though, we've only seen steps 1, 2, and 3. Let's introduce a new requirement. When an issue is assigned to an engineer, can we send them an email to let them know? We will always define where our use-cases begin and end. The latter two are being maintained here, but the first principle feels a little more strained. At the very least we're violating the Single Responsibility Principle; my rule of thumb for the SRP is "describe the behaviour of your class. If you use the word 'and' or 'then' you may be breaking the SRP". What does this class do? It assigns an issue to an engineer, AND THEN sends them an email. That's enough to get my refactoring senses tingling, but there's another, less theoretical, reason to split this method up, and it's to do with error handling. If I click a button marked "Assign to engineer", and I can't assign the issue to that engineer, then I expect an error. The system can't execute the command I've given to it, so I should retry, or choose a different engineer. If I click a button marked "Assign to engineer", and the system succeeds, but then can't send a notification email, do I care? What action should I take in response? Should I assign the issue again? Should I assign it to someone else? What state will the system be in if I do? Looking at the problem in this way, it's clear that "assigning the issue" is the real boundary of our use case, and we should either do that successfully, or fail completely. "Send the email" is a secondary side effect. If that part fails I don't want to see an error - let the sysadmins clear it up later. What if we split out the notification to another class? We don't really need a unit of work here, because we're not making any persistent changes to the Issue state, so what if we use a view builder instead? That seems better, but how should we invoke our new handler? Building a new command and handler from inside our AssignIssueHandler also sounds like a violation of SRP. Worse still, if we start calling handlers from handlers, we'll end up with our use cases coupled together again - and that's definitely a violation of Principle #1. What we need is a way to signal between handlers - a way of saying "I did my job, can you go do yours?" Commands are named with the imperative tense (Do this thing), events are named in the past tense (Thing was done). Commands must be handled by exactly one handler, events can be handled by 0 to N handlers. If an error occurs when processing a command, the entire request should fail. If an error occurs while processing an event, we should fail gracefully. We will often use domain events to signal that a command has been processed and to do any additional book-keeping. When should we use a domain event? Going back to our principle #1, we should use events to trigger workflows that fall outside of our immediate use-case boundary. In this instance, our use-case boundary is "assign the issue", and there is a second requirement "notify the assignee" that should happen as a secondary result. Notifications, to humans or other systems, are one of the most common reasons to trigger events in this way, but they might also be used to clear a cache, or regenerate a view model, or execute some logic to make the system eventually consistent. Armed with this knowledge, we know what to do - we need to raise a domain event when we assign an issue to an engineer. We don't want to know about the subscribers to our event, though, or we'll remain coupled; what we need is a mediator, a piece of infrastructure that can route messages to the correct places. What we need is a message bus. A message bus is a simple piece of middleware that's responsible for getting messages to the right listeners. In our application we have two kinds of message, commands and events. These two types of message are in some sense symmetrical, so we'll use a single message bus for both. to a list of handlers"""
to allow more than one handler for a command"""
Here we have a bare-bones implementation of a message bus. It doesn't do anything fancy, but it will do the job for now. 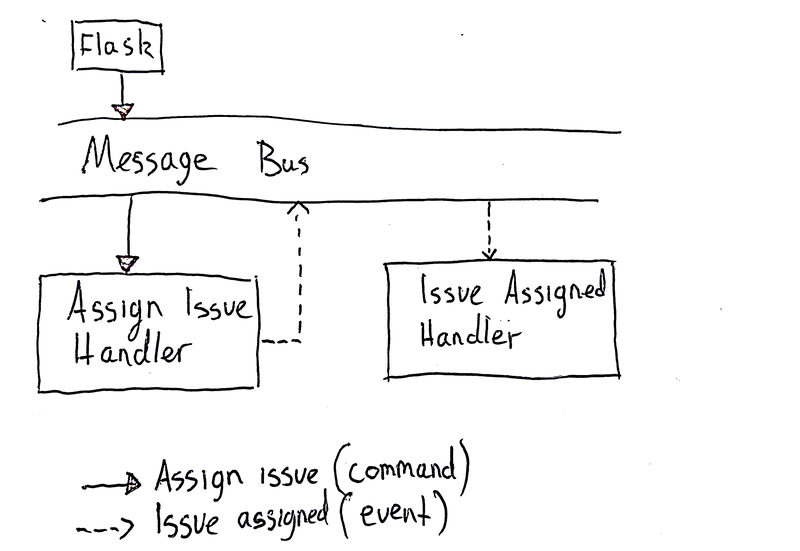 In a production system, the message bus is an excellent place to put cross-cutting concerns; for example, we might want to validate our commands before passing them to handlers, or we may want to perform some basic logging, or performance monitoring. I want to talk more about that in the next part, when we'll tackle the controversial subject of dependency injection and Inversion of Control containers. For now, let's look at how to hook this up. Firstly, we want to use it from our API handlers. I usually think of this event-raising as a kind of glue - it's orchestration code. Raising events from your handlers this way makes the flow of messages explicit - you don't have to look anywhere else in the system to understand which events will flow from a command. It's also very simple in terms of plumbing. The counter argument is that this feels like we're violating SRP in exactly the same way as before - we're sending a notification about our workflow. Is this really any different to sending the email directly from the handler? Another option is to send events directly from our model objects, and treat them as part our domain model proper. There's a couple of benefits of doing this: firstly, it keeps our command handler simpler, but secondly it pushes the logic for deciding when to send an event into the model. For example, maybe we don't always need to raise the event. The have_raised function is a custom matcher I wrote that checks the events attribute of our object to see if we raised the correct event. It's easy to test for the presence of events, because they're namedtuples, and have value equality. All that remains is to get the events off our model objects and into our message bus. What we need is a way to detect that we've finished one use-case and are ready to flush our changes. Fortunately, we have a name for this already - it's a unit of work. In this system I'm using SQLAlchemy's event hooks to work out which objects have changed, and queue up their events. When the unit of work exits, we raise the events. Okay, we've covered a lot of ground here. We've discussed why you might want to use domain events, how a message bus actually works in practice, and how we can get events out of our domain and into our subscribers. The newest code sample demonstrates these ideas, please do check it out, run it, open pull requests, open Github issues etc. Some people get nervous about the design of the message bus, or the unit of work, but this is just infrastructure - it can be ugly, so long as it works. We're unlikely to ever change this code after the first few user-stories. It's okay to have some crufty code here, so long as it's in our glue layers, safely away from our domain model. Remember, we're doing all of this so that our domain model can stay pure and be flexible when we need to refactor. Not all layers of the system are equal, glue code is just glue. Next time I want to talk about Dependency Injection, why it's great, and why it's nothing to be afraid of.